This site represents the author's hobby interests in the weather and web site building as well as to perform a public service for the Stillwater area for fast updated weather information. The site came online on Feb. 21, 2009. The actual weather station used to transmit weather data for this web site is installed on a post in the author's backyard. It is a solar powered Davis Vantage Pro 2 with backup battery power. Its accuracy is up to the demanding standards of the National Weather Service. As pictured, the weather station's features and its associated automated software make possible the posting of near real time, current weather conditions to this web site with great help from wunderground.com. These conditions include; temperature, humidity, dewpoint, wind speed, average wind speed, direction and precipitation. Near real time means the following readings are updated as often as: temperature 10 seconds, humidity 50 seconds, barometric pressure 60 seconds, rainfall 10 seconds, wind speed and direction 2.5 seconds. Numerical values briefly flash to green to indicate changes. So it's highly doubtful that you'll find any other site on the Internet where Stillwater weather station readings get updated faster. Use of Flashplayer is required. Also check out the indication for National Weather Service advisories or warnings under the Boomer Lake Park banner on the front page of this site. In addition to that, in the left column there is a fire danger indicator based on the Chandler Burn Index. In the main column, there is also the multi day weather forecast for Stillwater from the National Weather Service and links to regional weather radar, along with a link to a player to get audio from many NOAA weather stations throughout the country. The Stillwater station is included, if working. Recently added is a page listing recent earthquakes in Oklahoma. Another feature has the scene changing on the panoramic Boomer Lake Park banner located at top of the front page and this page, also, to reflect the current weather condition in Stillwater. The panoramic picture of partly cloudly skies at Boomer Lake Park, as pictured above in miniature, that sometimes appears at the top of the of most pages of this site to signify partly cloudy conditions in Stillwater, was snapped during the noon hour, as it was showing a line of severe storms starting to develop just hours before a storm did arrive with a tornado warning on February 10th, 2009. 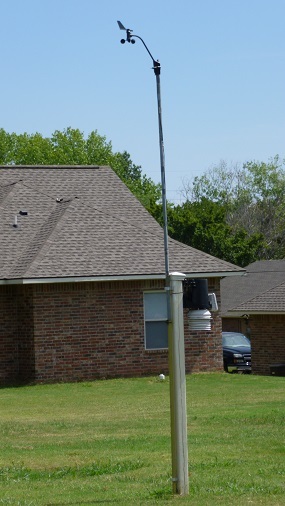 This is a privately owned and operated home weather station with a web site unaffiliated with any business or governmental entity. It's more than just a forecast. Weather forecasting is not an always exact science. Therefore, no important decisions should be based on the information presented on this site. Help get the word out. Get this FREE bumper sticker. Just send an ->E-mail with your Stillwater mailing address.